With festival season underway I thought we should try a DIY that was functional for festivals (FFF, can we make that a thing?). And what could be more practical than a pouch?! Making your festival handsfree. Perfect. Depending on what kind of gal (or guy) you choices for fabrics can differ. We went for a mixture of fabrics and patterns - this is a great project if you any scraps. You want to make the pouch a size that will fit all your must-have items, so it can be as big or as small as you like. We made ours big enough to fit a phone, coin purse and some bits & bobs of make-up. 1x 9 1/2" x 10 1/2"
1x 9 1/2" x 8"
1x 2 1/2" x 3 1/2"
Sewing Machine...Needle & Thread can be used too. 1/ Taking the smallest piece of fabric (2 1/2" x 3 1/2") press 1/2" on all sides. Stitching down the shortest sides. 2/ Fold the largest piece of fabric so that is 6 1/2" x 9 1/2" wrong sides facing together. Place the smallest fabric in the centre of the this large piece and pin in place. Stitch down the longest sides of what is now the belt loop. 3/ To the top of this large fabric add one side of each of the snap fasteners, on the right side of the fabric. Set round 1" from the edge of the fabric. Repeat this step on the remaining piece of fabric. 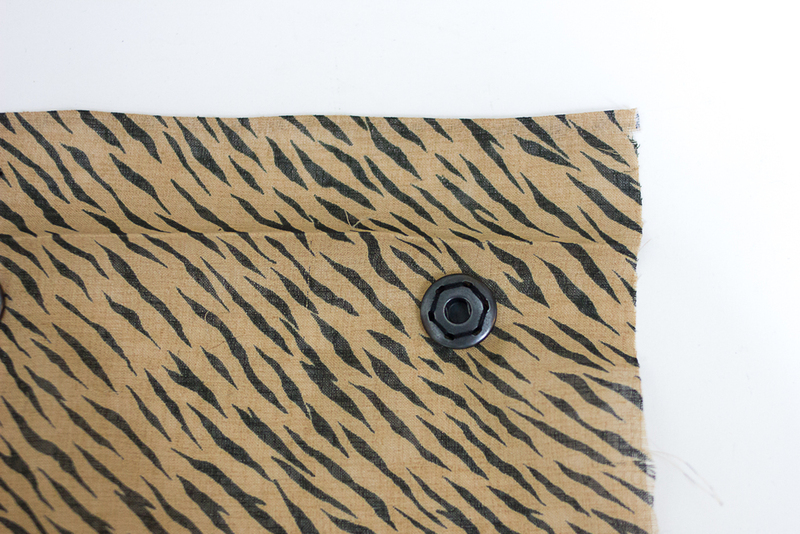 4/ Press the edges of both fabrics (next to the snap fasteners) 3/8". Larger Piece, fold and press 3/8" edges on the each side 3" down, fold 1 1/2" and pin in place then stitch to secure. Smaller Piece, fold top edge 1 1/2", press and pin in place. Stitch to secure. 5/ Now place the the two pieces of fabric right sides together. Starting at the bottom and pin in place on three sides. Stitch to secure leaving 1/2" seam allowance. Start at the top of the larger piece, sew as close to the edge as possible. 6/ Turn the pouch inside out and press. 7/ Now for this step you can either use a belt or like we have done here, cut your desired length of ribbon/tape diagonally at the ends and feed it through the belt loop on the pouch. And you are ready to hit the festivals!